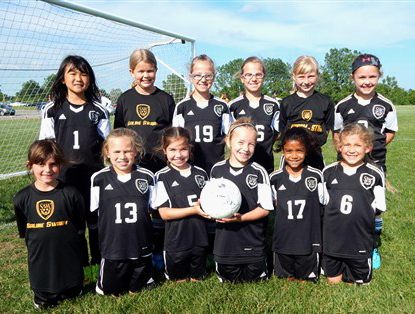 Mindy Warden and her family have been involved in the Saline Area Soccer Association in Michigan for years as supporters and cheerleaders, but last year, when Mindy’s oldest daughter began her first year of travel on the club’s U8 team, Mindy was asked to be team manager. She stepped up to the task and signed up for TeamSnap to help. The SASA has recreational and travel teams that run from the 3- and 4-year-old Mini Kickers all the way up to high school level. In addition to focusing on skill development and player growth, the club’s mission is to also create a lifelong appreciation for the game and foster creativity, commitment, confidence and sportsmanship in all players. Mindy said she’s seeing that firsthand with the girls on her teams. Of course, managing two teams of eight girls each has its challenges. A parent mentioned TeamSnap to Mindy, and she was hooked, saving time by avoiding excessive emails and texts back and forth with parents. Mindy says her favorite feature, by far, though is Availability. Before using TeamSnap, figuring out who could play which game was a challenge, sometimes requiring the team to even change game plans. Mindy’s Black Team finished second in their division and came in a close second in our spring tournament, the Canton Cup. The Gold team placed first in their division with only one loss for the season. Now, this year, it’s on to managing the same girls, with a year of experience and a wealth of talent as U9s. TeamSnap’s cheering for you! Stephanie Myers is the Senior Marketing Manager for TeamSnap. When she’s not at work manning the marketing department’s helm, you can find Stephanie playing lawn games or working on her 95-year-old craftsman home in Memphis, Tenn.